This tutorial series is intended to be used with mental ray for Autodesk Maya 8.5. “Happiness is like the sun: There must be a little shade if man is to be comfortable.” - Let's start our exercise with this little quote by Otto Ludwig. 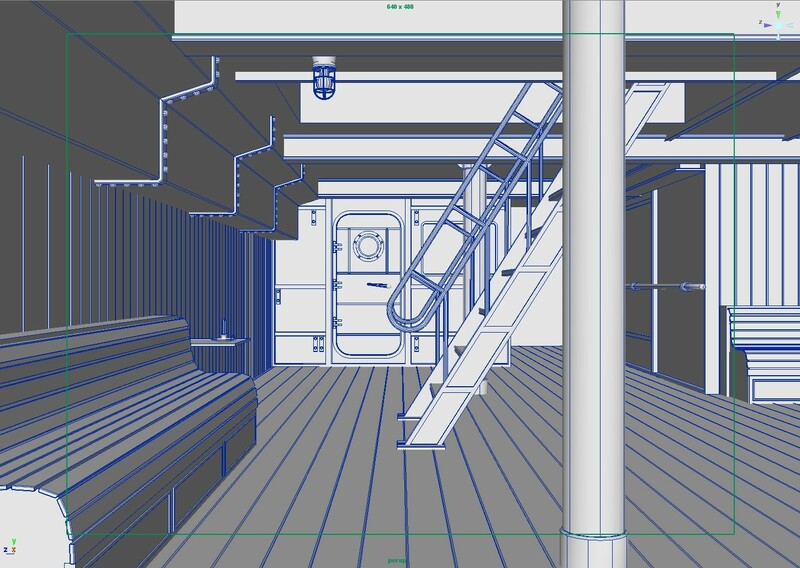 As you can see, we have a closed room; you can tell by the porthole and the characteristic door that it is a room inside a ship. Let’s imagine that it’s a tween deck of the ferry “MS No-Frills”, used as a lounge, and the staircase leads to its upper deck. If you open up the scene, you will see that there’s no proper point of view defined yet. Feel free to either choose your own perspective or use one of the bookmarks I have set in the default perspective camera (Fig. 2). 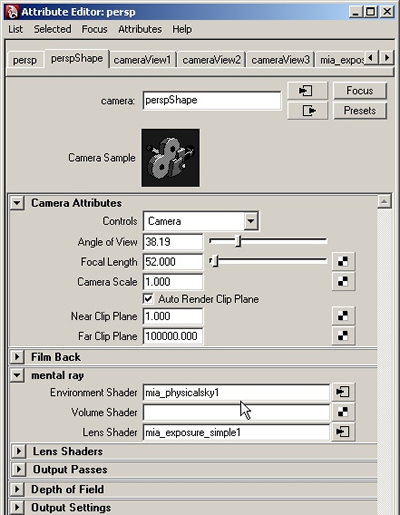 By clicking on one of the bookmarks, all relevant camera attributes (position, orientation, focal length, etc.) are changed to the condition stored in the bookmark. This greatly helps when trying out different views without committing oneself, and without creating an unnecessary mess of different cameras. 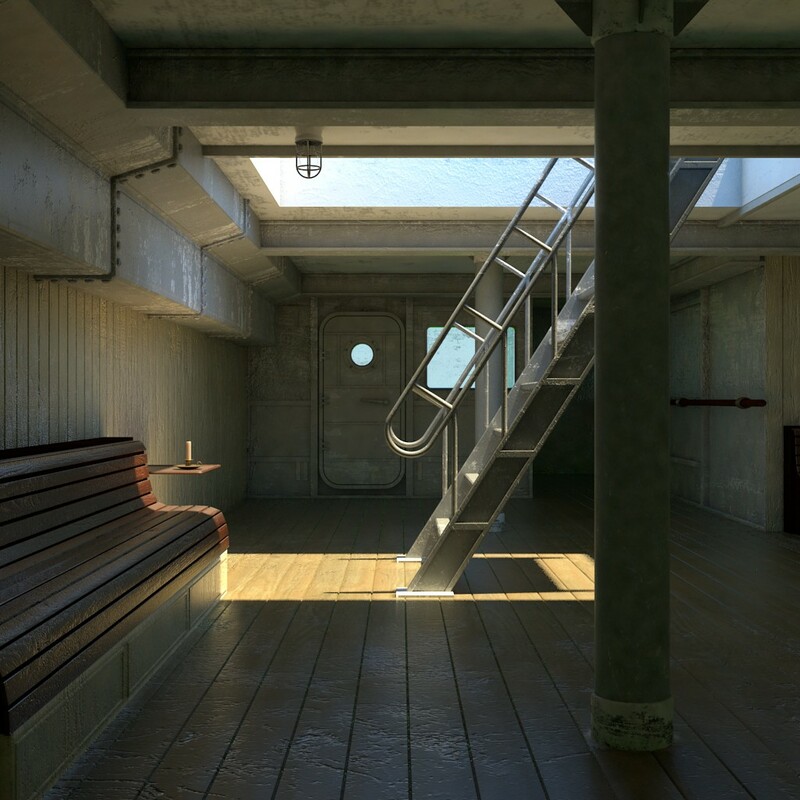 Before we start lighting and rendering the scene, we should have a little introduction to the actual shading of the scene and about a few of the technical aspects of things such as color spaces. If you find this too boring then you might want to skip the next two paragraphs as this is not essential, but is nonetheless an explanation regarding how to achieve to the result at the end of this tutorial. A Note on Color Space. So, let’s get started with lighting the scene... Maya 8.5 introduces, along with the mia package, a handy physical sun and sky system. This makes it easy to set up a natural looking environment and we can then focus more on the aesthetic part of the lighting process, instead of tweaking odd-looking colors. The sky system is created from the render global’s environment tab (Fig. 6). d) a tone mapping lens shader called mia_exposure_simple, which also connects to the camera’s mental ray lens slot. It’s also worth mentioning here that this button also turns Final Gathering ON. Now that we have a default sun and sky system set up, we are almost ready to render. Before we do the first test render, let’s make sure we are in the right color space, as mentioned. By default, we are rendering in true linear space (for an explanation please refer to the previous notes on color space), which is - for our needs right now - not correct. The lens shader we created however brings us into a color space which closely approximates sRGB by applying a 2.2 gamma curve (see the Gamma attribute) globally to the whole rendered image, as we calculate it. Generally, this is a good thing and is desirable. But if we apply a gamma correction in this way, then we would have to “un-gamma” every single texture file in our scene. This is due to the fact that the textures already have the “right” gamma (this is usually true for any 8bit or 16bit image file), and adding a gamma correction on top of that would double the gamma and could potentially wash out the textures’ colors. What a bummer! So, we either have to “un-gamma” every texture file (boring and tedious), or instead of the lens shader’s gamma correction, we can use mental ray’s internal gamma correction (still boring, but less tedious). As you can see from Fig. 8, we set the Gamma value in the Render Globals’ primary framebuffer menu to the desired value, which is - simply because mental ray works this way - 1 divided by the value (2.2 for approximating sRGB in our case), which equals 0.455. 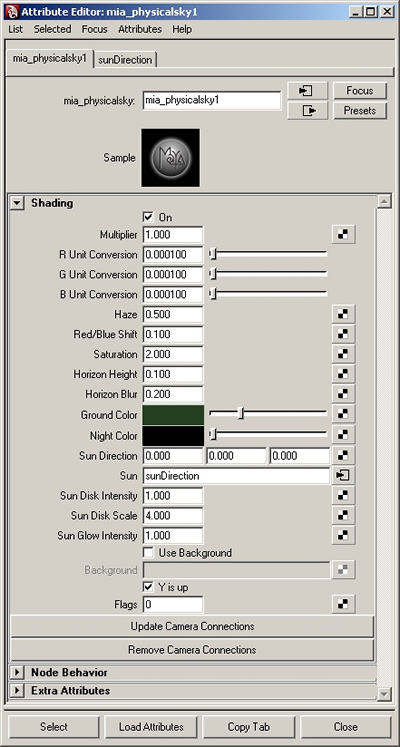 At the same time, we also need to remove the gamma correction of our lens shader, so we must set its Gamma attribute to 1.0 (linear equals no correction; you can select these shaders from the hypershade’s Utilities tab). Thus we completely hand over the gamma correction to mental ray’s internal mechanism, which automatically applies the right “un-gamma” value to every of our textures. There are no more worries for our color textures now. If we use “value” textures however (like for bump maps, displacement maps, or anywhere where a texture rather feeds a value than an actual color), we'd have to disable this mechanism for the particular “value” texture by switching a gammaCorrect node in front of it, with the desired gamma compensation (2.2 in our case) filled into the gammaCorrect's Gamma attribute (note: this attribute does not mean the value for the actual color^gamma function, it rather indicates the desired compensation situation, i.e. the “inverse”, or reciproke of the gamma function - no one ever would tell you about that, but now you know better). This is a long-winded theory, but now we’re ready to go! 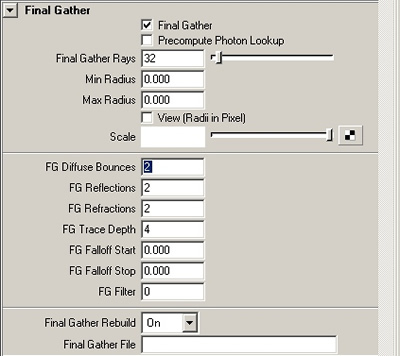 I tweaked the Final Gathering settings (Fig. 9) so that we will get a relatively fast converging, yet meaningful, result. I also turned down the mia_physicalsun’s Samples to 2. It’s kind of dark and has a few errors (Fig. 10), mainly because of insufficient ray tracing settings. Let’s now increase the general ray depths (Fig. 11) and the Final Gathering ray depths (Fig. 12). We’re also turning the Secondary Diffuse Bounces on. However, the Secondary Bounces button in the Render Globals only sets their Bounce Depth to 1; we want it to bounce twice so we’re selecting the actual node where all the mental ray settings are stored, which is called “miDefaultOptions”. You can do this by typing in “miDef*” in the input line with LMB Select by name on (the asterisk is a wildcard for lazy people like me, see Fig. 13). 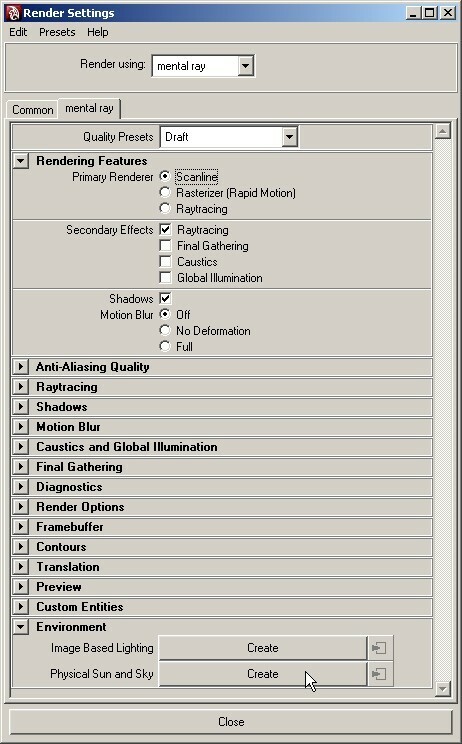 Once we select the miDefaultOptions, all more or less hidden mental ray settings are exposed to the attribute editor. There’s also some stuff in the mentalrayGlobals node, but we’re focusing on the Final Gather tab in the miDefaultOptions right now. Let’s set the FG Diffuse Bounces attribute to 2 (Fig. 14). These ray depth settings should suffice to get the result at the end of this tutorial. 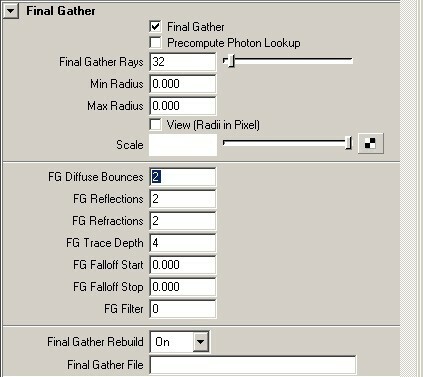 Let’s re-render (Fig. 15). It is still pretty dark, but you can tell that the indirect light contribution is sufficient (don’t worry about detailed shadowing, we’ll get to that later on), so we need to actually raise the exposure level of our piece, somehow. Remember, we’re all still on the very basic default settings for everything. 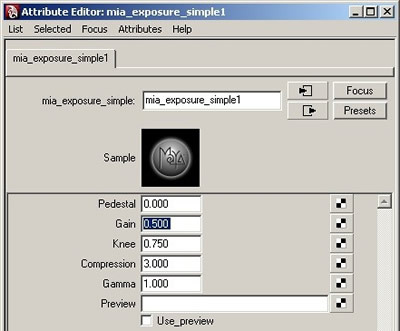 One setting used to tweak the exposure is the Gain attribute in the mia_exposure_simple, which is connected as a lens shader to our camera. Let’s increase the Gain value to 0.5 (Fig. 16). That’s much better, and gives a more natural feeling (Fig. 17). Now we can start to actually make decisions on the lighting and aesthetic accentuations. For this part, please don’t feel constrained to the settings and colors that I choose - feel free to follow your own ideas! I’m rotating the sunDirection to X -70, Y 175, Z 0 to accentuate certain elements by direct sunlight, and I’m setting the attributes of the mia_physicalsky to the values you can see in Fig. 18. I increased the Haze value to 0.5 (note that this attribute takes values up to 15, so 0.5 is rather low). Then I set the Red/Blue Shift to 0.1, which basically means a white-balance correction towards reddish (towards blue-ish would be a negative value, like -0.1). I also raised the Saturation attribute to 2.0, which is it’s maximum value. I then made slight adjustments to the horizon, which does not have much effect on the global look but I experimented with what we could see through the porthole and the window. The last thing I changed was the Ground color. I gave it a greenish tint because I thought this gave it a more lagoon-like feeling, and I think it gives the whole piece a more interesting touch (Fig. 19). From my own point of view, this is a good base for what we intended to accomplish with the early afternoon in the Mediterranean Sea scenario. 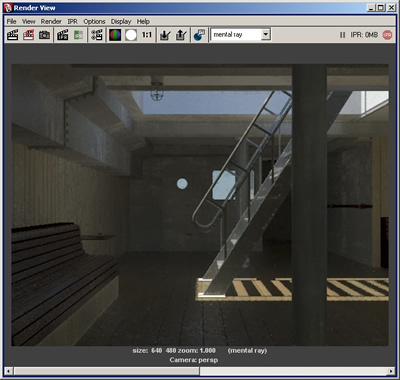 If we’re satisfied with the general look, we can then go about setting up the scene for a final render. Firstly, let’s increase the Final Gathering quality, because we can reuse the Final Gathering solution later on. As you can see from Fig. 20, I raised the Accuracy to 64, but more importantly, and especially for the shadow details, the Point Density is now at 2.0. With a denser Final Gathering solution we can also raise the Point Interpolation without losing too much shadowing contrast. I also set the Rebuild setting to Off, because the lighting condition is not changing from now on and we can therefore re-use existing Final Gather points. Let’s have a look (Fig. 21). As you can see, there is still a lack of detail in the shadowed areas, especially in the door region. We can easily get around this with the new mia_materials which implement a special Ambient Occlusion mode. You only need to check on for Ambient Occlusion in the shaders, as everything else is already set up fairly well by default (all I did was set the Distance to a reasonable value and darkened the Dark color a little). 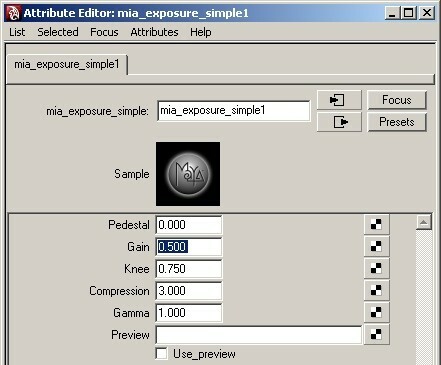 The main trick is the Details button in the mia_material (leaving the Ambient at full black). By turning on the Details mode, the Ambient Occlusion only darkens the indirect illumination in problem-areas, avoiding the traditional global and unpleasant Ambient Occlusion look. See Fig. 22 with the enhanced details. 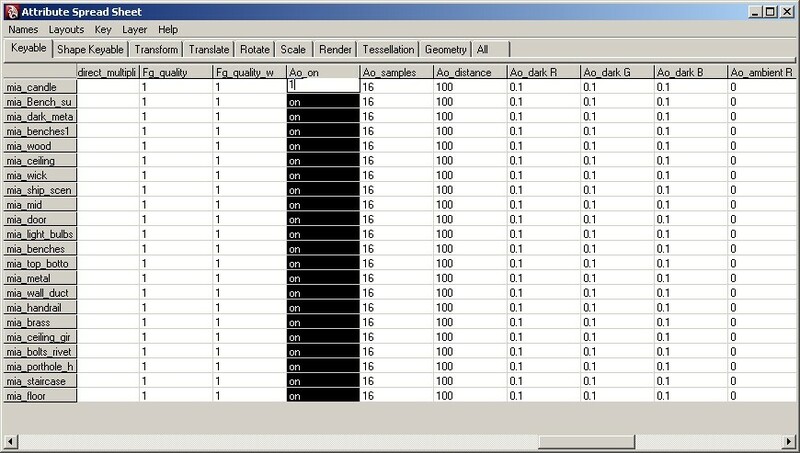 Note: to adjust the shaders all at once, select all mia_materials from the hypershade, and set the Ao_on attribute in the attribute spread sheet to 1 (Fig. 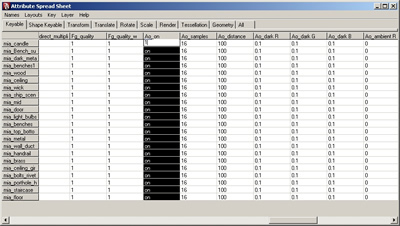 23) (the attribute spread sheet can be found under Window > General Editors > Attribute Spread Sheet). Also note that switching on the Ambient Occlusion in the shader scraps the Final Gathering solution; it will be recalculated from scratch. 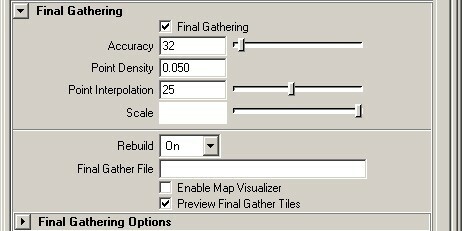 If you find the Final Gathering taking too long, turn the Point Density down to 1.0 or 0.5, as this still gives you nice results but the lighting details will suffer. Now let’s increase the general sampling quality (Fig. 24). 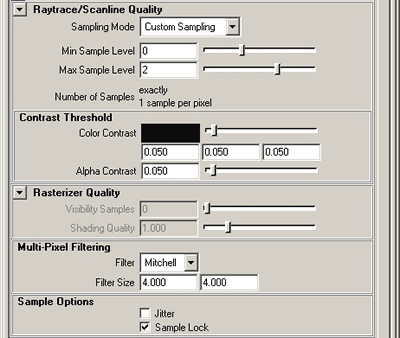 The sample level is now at Min 0 and Max 2, with contrast at 0.05 and the Filter set to Mitchell for a sharp image. Last but not least, if you are having problems with artifacts caused by the glossy reflections, raise the mia_material’s Reflection Gloss Samples (Refl_gloss_samples) up to 8 for superior quality. You can do this with the attribute spread sheet, as well. For the final render, I chose to render to a 32bit floating point framebuffer, with a square 1024px resolution. This can be set in the Render Globals (Fig. 25). 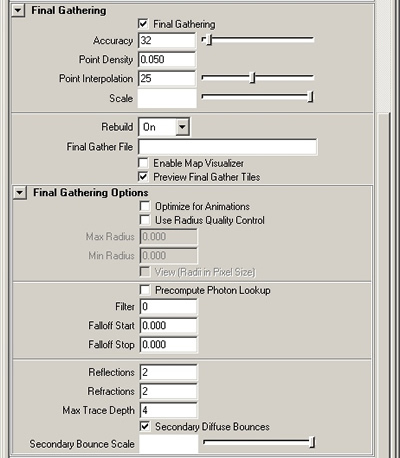 If I want to have the 32bit framebuffer right out of the GUI (without batch rendering), I need to turn the Preview Convert Tiles option On and turn the Preview Tonemap Tiles option Off, in the Preview tab of the Render Globals (Fig. 26). Important: I also need to choose an appropriate image format. OpenEXR is capable of floating point formats and it’s widely used nowadays, so let’s go for that (Fig. 27). When rendering to the 32bit image, you will get some funky colors in your render view, but the resulting image will be alright - don’t worry. After rendering, you can find it in your projects images\tmp folder. Fig. 28 shows my final result: a pretty good base for the post production work. Since we rendered to a true 32bit image, we have great freedom for possibilities. See Fig. 29 for my final interpretation where there is no additional painting, only color enhancement. Try it for yourself! I hope you have enjoyed following this tutorial as much as I enjoyed writing it! dude, i cant thank you enough for these tutorials. really great stuff. you are indeed a prince among men. Thanks man,but where is the scene which we can practise. very thx ,if have video,i well crazy! i can't thank u enough man. this is just the tutorial i'm looking for . What do you do your colour treatment in? Photoshop is pretty sad when it comes to dealing with 32bit files. Great tut, but I can't seem to find a link to the scene file. cant find a file either. would love to do this tutorial with that file. Thank you so much for this detailed lighting tutorial, it's very hard to find Maya + MR lighting tutorials nowadays. Looks detailed. can't find the scene file though. Hey, great work, will you post a link for the scene file? so it's possible to better follow along? Great Tuts. Please post the scene file. 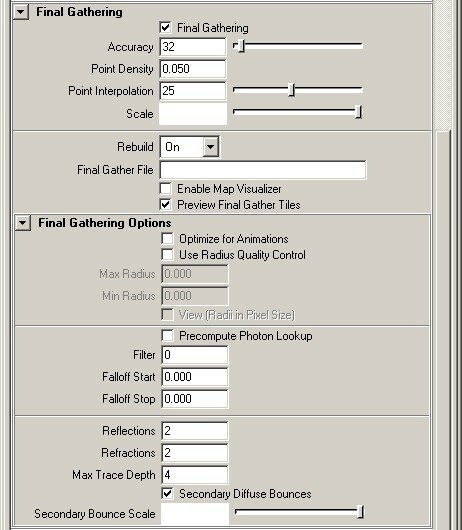 That's a Amazing tut, really helpful to me.. can't find the scene file, can you mail to me?? can you mail to me the answer? Great great tutorial, I can't thank you enough.... is it there any chance of sending me the scene files ? I really would like a link to the scene file. grat Tutorial.. cya! This is absolutely amazing tutorial! It's rare that you find tuts that show you how to "finish" a piece and thats what you have seemed to do here. I've tried to make my own scene, using a grand type staircase with a big glass dome. but I would be verryyy interested in the scene that you have here just to practice. It's gorgeous. If you can send it to me I would be very appreciative, I know others are also interested so maybe I could host it for you. fantastic tutorial, i've been looking around for something like this for a while. would love to get the scene file if thats possible!! One thing thats confusing me is where you are getting the Gamma value 2.2?? Care to explain. Thank you everyone for your comments! If I missed anyone who requested the scene from me, please try again! I would appreciate a copy of the scene file also. Thanks so much for your efforts. @Mitch: Drop me an email or post your address please! My teacher introduced your blog and i got huge idae for my project which is churhc interior under moonlight. For further study, would you send me a scene file? Rather than posting my email here, I sent you a PM on CG Talk. I would love to have the file so I can play with it. Thanks much for posting your tutorial. I've been using Max for several years now, am am starting to use Maya at home. 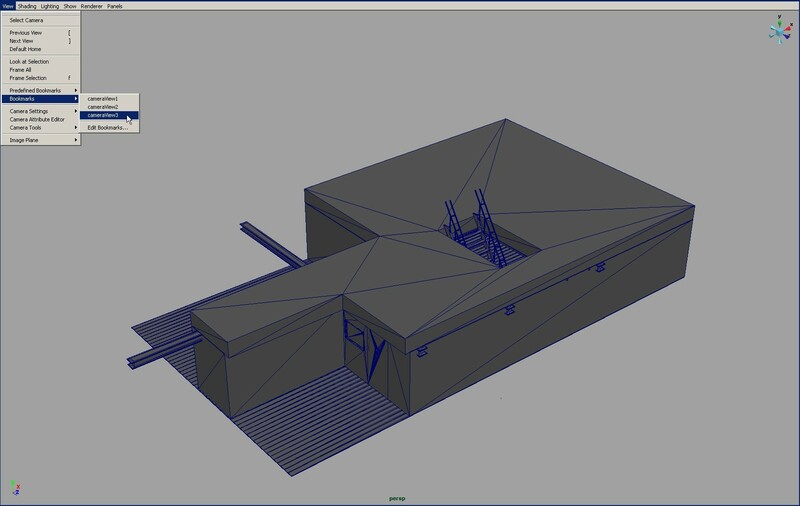 One of the areas I hope to become more knowedgable and skilled at is lighting and materials - thanks for the jumpstart. I also would greatly appreciate being able to use your tutorial scene. Excellent tutorial on what is a tricky area to understand! Please may you send me the scene file so I can have a go? truly speechless at the quality and clarity within this the first tutorial. I can't wait to read the rest. An earlier post asked where and how you did your post work. Any chance you could elaborate on this point? Great tutorial, could you send me the scene file? Can you please graciously send me the scene file for underwater ship. This is one of the best tutorial I have ever seen. Can you please send me the scene file? Great great tutorial, please is it there any chance of sending me the scene files ? Merci beaucoup! very nice tutorial. i didnt know that mental ray was overwriting the gama. thanks a lot. it ll be great if i can have a look of the scene. can you send it to my email in your spare time? Could you please send me the scene file? Could you send me the scene file? Very helpful lesson. Could you send me the scene file? My email address is joseph.cruel@gmail.com. Will you Please send me the Scene file?? i to would like a copy of the scene file if you could. Beautiful tutorial! I just came across it today and would love to work through it on my machine. Would you mind sending me a copy of the scene file? Would you mind sending me a scene file? i just want to practise. Floze, I've been looking for a detailed tutorial on lighting in Mental Ray for the longest time. Thanks so much for making everything so easy to follow and understand. Can you please send me the scene file? Floze nice tutorials, I've been looking for a tutorial on lighting in Mental Ray for the my demoreel. Thanks so much for such a good help. Would you mind sending me a copy of the PDF file. Awesome tutorial , thank you so much for the effort! Helped out tons! But do you prefer to work in cm or in meters (real world scale models) for a more "physical" result? does not drink or smoke..."
Great job - Great help. Still trying to wrap my stoned head around the gamma and LWF stuff. I think it's very helpful to all of the illuminator. Can you give me a permission to translate it in Korean? And Can I get the scenefile? Awesome tutorial , thank you so much for the grate effort,can u mail me this tutorial in PDF format, I have scene file with me. Thank you very much, it's amaizing! I would like to try it step by step on your file, is it possible to have it please? Thank you so much. Could you send me scene files, please? Can i too please get the scene file top follow along with. Hi Floze. Excellent tutorial - looks like the definitive work on the subject from my research! Good tutorial, if you could send me the scene, I would appreciate that. wow, great tutorial with real understanding and useful explanation. thanks so much. Please send the scene file so I canpractice more. Finally find a tutorial worth looking into! Thank you for this Floze! Could you also mail me the scene, so i can study this some more? Thanks for the great tutorial Floze! Hmm, haven't heard from you Floze yet. could you send me the scen file, please? my email address is snakerufus@libero.it. Hi there, tutorial looks sweet, can i have the scene file to follow tutorial easier? I very like this tutorial,please give me a scene file.Thank you! I am searchzhu,from china.Please send scene file to searchzhu@126.com.Thank you very much! First of all, thank you so much, what a great tutorial that you share with us. I have been trying to apply this linear workflow for work. but unfortunately, I got confused with the gamma, degamme...and etc. therefore, I think I need to take anther deep look into this whole linear workflow. Would u mind sending me the scene file that I could follow your tutorial here. thanks again. Would you send me the scene file to stream0626@163.com ? Floze!!! wonderful tutorial. Is the first tutorial were it explains every step of the lighting part, right to the finish. Great tut! Thanks a lot! Very interesting tutorial. May I have a scene file too. Very interesting! Thank you for the great tutorial! Please can I get a scene file? Hey mate this is awesome, would i be able to look at the file scene? This would be awesome to add this to my talk on lighting. Awesome tutorials i cant thank you enought man. Could you send me the scene file to alvarogranadosp@yahoo.es? I wanna try it right now! Just a an awesome beautiful tutorial that should be a template for anyone doing a tutorial on anything. Clear,Concise,Gorgeous. Can I also join the bandwagon and get the scene file? plz can you explain the connection in this part? cuz I cant understand what atributes I have to connect. PLZ! Best mentalray tutorial have ever seen. Please can you send me the scene file. Hey floze thanks for the great tutorial it helped me alot. Hi floze, i want to add my admiration and gratefulness for this brilliant work. amazing! i wonder if you would change anything with the latest mia_portal_light. i was looking for the documentation when i came across your tutorial. hope its not too late to ask for scene file too. my e-mail is gkanomi@yahoo.com. thanks and have a nice day! Will there be anymore tutorials in the future? Thanks for the great stuff Floze! on here and in the CGtalk forums! *jumping on the wagon* can i get the scene too? Well written tutorials. I've learned a lot doing the first two with my own seen. I'd appreciate if you could send the scene you use in the tutorial so I can better follow along in the rest of the tutorials. for those still looking for the scene file, if you read up on the cgtalk forum and then, maybe, hop over to 3dtotal.com you'd see they are still selling this tutorial w/ the scene file for L8.95. He didn't make the file so can't give it away. 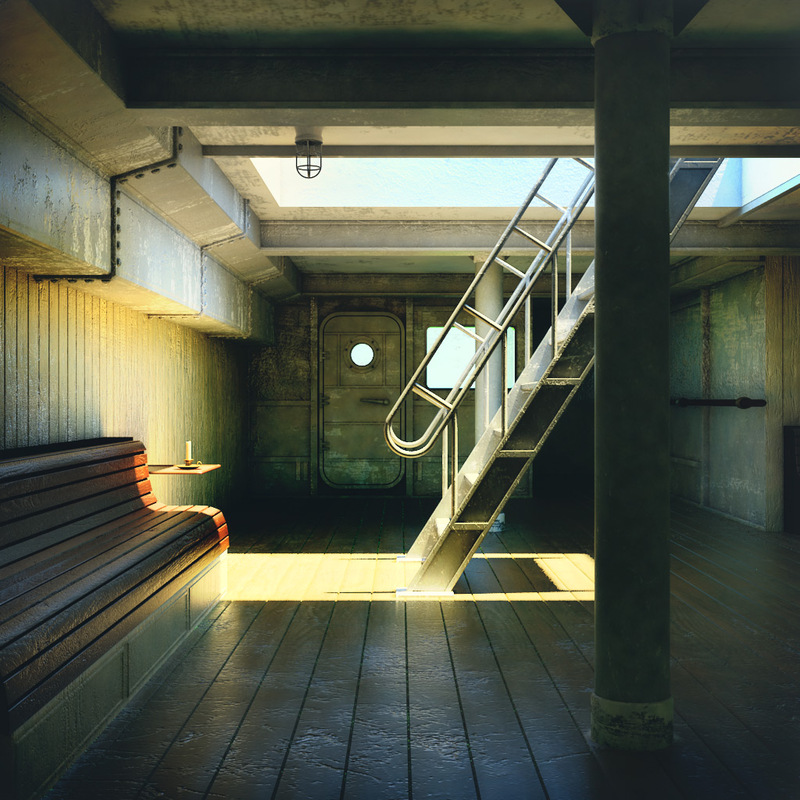 The tutorial is fairly cheap if you want the scene file and more follow along pictures. Thanks for the great tutorial! Thank you so much for such a great tutorial! I cannot find a link to download the sample file anywhere. Could you please email me a copy? Also would it be possible for you to do a brief tutorial on how you set up materials using the A&D material? badugah at gmail dot com. One of the most detailed and intelligently designed tutorial I have ever seen on the web. Plus u have cleared a big confusion of Mental Ray global .455 settings. I would love to go through this project practically, please if you could provide me the scene file. Thanks a lot for sharing this great stuff. congratz buddy. This is one of the best posts on environmental lighting I've seen. Would love to get the scene file to play around with. Please send to jezusK@hotmail.com when you have a minute. Just found this tutorial, and it looks great. Yes this post has been going for a while now and its still relevant today. I have Maya 2010 and I am trying to learn it. This is a great Tutorial and I would love to try it with the file too please if you would be so kind. Thanks again and are you planning to do any more? Hi, i'm Raffaele from Italy. Great tutorial. Can i have the scene files, plese. Hi! I am Eugene from Ukraine. This tutorial is what i wanted to find. Can you please send me the scene file too? Thanx! Sorry, I forgot to write my email - zheka118@yandex.ru . is it there any chance of sending me the scene files ? This is great... you mention to open the scene file but there's no apparent link. Is this omitted on purpose or do you have the file somewhere else for sharing? An absolutely spectacular tutorial. Been looking for something like this for a long time. Can't believe it took me this long to find it. Would you be willing to send me the scene file, or a link to where it's posted. Thank you so much. HEy Dude Nice Tutorial, and saw you turkey pictures they are awesome, especially That Muslim Girl Picture it was too good . very cool tutorial! thx for sharing! it's an amazing tutorial,,we help us very much,,thank you again ,,and please ,can you please sent me the scene file too ?? i'm AUREL from ROMANIA. Beautiful tutorial! Very insightful many thanks for posting this for everyone. I would really appreciate the scene file so i can follow the tutorial a bit closer. hi floze, great tutorial! Can you send me the scene file to sgheavenland@hotmail.com? Im dying to try this tutorial! Thanks! please! Can you send me the scene file. For learning ilumination. I am live in Brazil and want learn Maya and Mentalray. Thanks! I read a bit on CG Talk that you couldn't release the scene, but if indeed you can distribute it legally (all these requests for the scene make me anxious) I would be most grateful. Thank you sharing your knowledge with the cg community! absolutely outstanding tutorial!!! i almost droped down from my chair when i was reading this. i see that many people request the scene file so i would like to get a copy as well please. your tuterial is so cool. it will be better if i could get scene file. would you mind sending scene file to me ? i begged the scene file about a month ago but i couldnt get yet. are there someone who is same to my case? Wow! GREAT tutorial! could u send me the scene too? Hey Floze! Awesome tutorial bro!! Can I get the scene files? Can I get the scene file so that I can try it! Can I please get the scene file so that I can try it!? oh yeah.. and I'm the type of idler that has recently awaken to realize that I don't want to be an idler any longer. I think you said something not correct when you talk about colorspace, the reason images in srgb are gamma-corrected is to linearize "visually" because our eyes see linearly, but display devices such as monitors don't output a linear luminance. 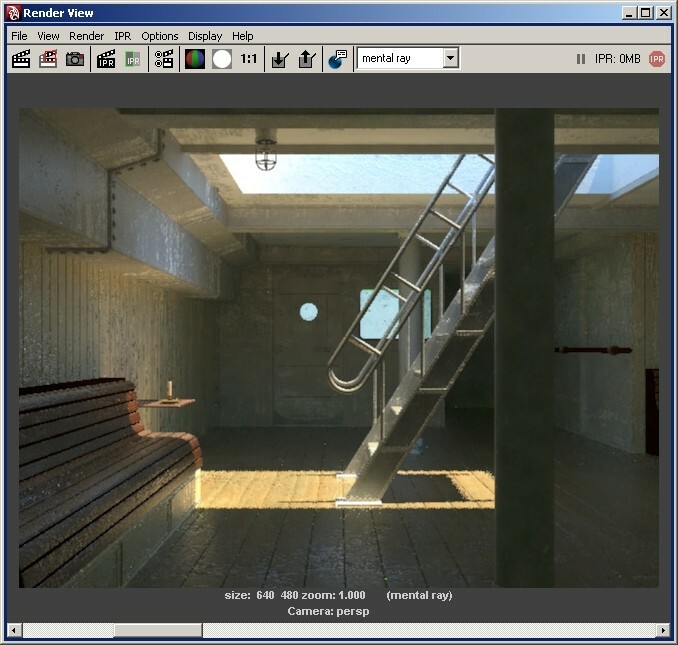 Hello, I bought the Environment Lighting - Maya (Download Only), but there is no scene. Thanks a ton for this tutorial.. I was hoping I could also get a copy of the scene file. Thanks! Hey could you send me a scene please? Hey, great tutorial. Are you still sending the scene file out? I'd love to follow along through this. thanks dude, your tuts very helpful our beginner. Can i get this origin Scene? Hey Floze, your tutorial looks amazing, the Lighting are beautiful. I just finished my studies in Supinfocom but I want to work lighting more. Can you send me the scene ? Can you send me the scene ? great tutorial man. the best i ever seen till now. can i have the files to play with it? I'm experimentally sharing the scene file with you guys in this sifon. I'd be pleased to meet you there. Flash player 10.1 needed. My teacher told me about your tutorial. Great tutorial! Please send me a copy of the scene file. Thank you so much. . I'm interested in doing this of course, so if you please could sent me the file scene I would appreciate it! I'd really appreciate the scene file as well. Great Great Great tutorial. Thanks for the tutorial it has helped me a lot. I would really like to have a look at the scene file and test a few settings if you don't mind. Could you send me the file so I can also have a got with it. can i get the maya file please? good job m8... can you send me the maya files please??? Thx so much. thanks! im still a student and i would love to learn this stuffs for my portfolio. thanks again and God bless! Many thanks for sharing this tutorials! If you please could sent me the file scene I would appreciate it! Hey! Florian.. Thanx for this great Tutorial.. Just whats needed for any Lighting n Compositing Enthusiast.. Can you please send the scene file for the project to cool_hum143@yahoo.com... I'd be realy helpful. I can't believe I found such a great tutorials! Can I get Maya scene to start master my lightning? :? Hi Floze, thank you for this detailed tutorial, so clear. Hi.Great tutorial.Would you send me please the scene file.Tank you! this tut is awesome. could u please send me the scene file on kavss.88@gmail.com. thans for sharing ur gr8 knowladge!!! Hi this is great tutorial. Could you please send me the scene file? Thank you. Hi I searched on the internet and many recommend this serial of threads. Thanks for sharing these great tutorials however I found the broken link of all images (invalid floze.de), anywhere I can find those images? By the way, like the other users I would also love to have the scene as well! Please contact me via 'rayting0812 at gmail.com' and million thanks in advance! I'm actually unemployed and wanted to play around with your tutes.. They've been out for a while but I'm surprised I couldn't find the scene file anywhere! Could you possibley send them to me? Hi I'm from Japan. Great tutorial. I learned a lot from your site. Like others, could you please send me the scene file? wonderfull could you please send me the scene file? I would really appreciate if you could send me the scene file at c_abdulqadir@yahoo.com. I am doing an independent final for my animation workshop on maya lighting. I can't even begin to tell you how incredibly helpful this was. I only with I had found it about 4 scenes earlier. Hey, awesome tutorial. Could you send me the scene file at m6d5@yahoo.com? Looking for the Six Tuts On Light And Shade?